Tired of the dirty, scaly, dingy tiles around your swimming pool? How about the white mustache coming from the spa overflow or the swimming pool water falls. Swim Clear Pool Supply has a solution. The easy to use stain removers eliminate most types of stains and deposits including: rust, calcium scale, calcium deposits and many other stains. They will not scratch or gouge (when using proper eraser on appropriate surface). Use by hand or attach to any standard telepole. The Stain Eraser shown to the right is perfect for the organic stains on the swimming pool surface like leaves, dirt or crape myrtles. This can also be used to clean your tile from the oily residue left from suntan lotions or tree pollen. The Pumice stone shown here in the center of the page is an easy to use hand held tile cleaner. Just like the stain eraser, the Pumice Stone is perfect for the oily residue left from suntan lotions and tree pollen. And to your left is the ultimate calcium fighter the Kalcium Killer. Provides instant results and makes cleaning the calcium off your tile much quicker then waiting for the harsh chemicals to dissolve them. Uses no chemicals and works wet or dry. With these cleaners, we don't always have to worry about our swimming pools. This product is totally a great deal! 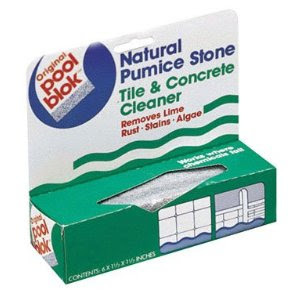 I find the Pumice Stone Cleaner a one-of-a-kind pool cleaner. Most of the time, a swimming pool becomes too contaminated, so much so that the water becomes such a sludge cesspool, if unattended.